Deep rumbles, unearthly moans, high pitched screeching: these are but a few elements of the alien soundscape researchers have now recorded for the first time at Challenger Deep, the deepest known valley on the seafloor. 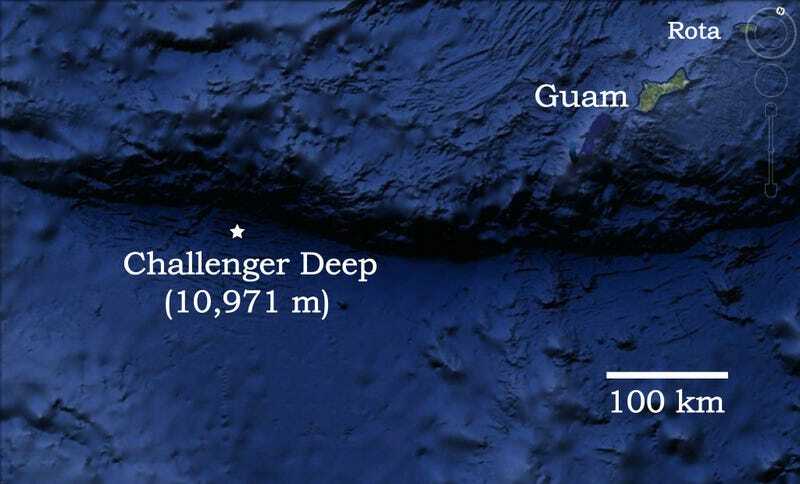 One might expect Challenger Deep—which sits at the bottom of the Mariana trench some 36,000 feet beneath the ocean surface—to be a quiet place. But in reality, we know very little about what life is like down there: as with most places where the sun never shines, the Mariana trench is shrouded in mystery. Dziak would know. He's the guy who led the recent effort to capture audio recordings from Challenger Deep. First, Dizak and his team had to design and build an instrument that could withstand the crushing 16,000 pounds-per-square-inch worth of pressure felt seven miles beneath the surface. Next, they developed a mooring system that would lower their audio gear—a titanium-encased hydrophone—at a slow, controlled speed, so that it could acclimate to the dramatic pressure buildup during its journey. And after successfully planting a hydrophone in Challenger Deep, and making recordings for 23 straight days, Dziak's team had to wait until November for the weather and ship traffic to clear so they could haul it back up. It was a major effort, but now, we've got the first soundbites from the deepest spot on the Earth's surface to show for it. They're as haunting and otherworldly as you might imagine. Challenger Deep, it turns out, is an echo chamber for a cacophony of noises produced by everything from ships to baleen whales to Earth itself. In one recording, the researchers even identified the ominous rustling of a category four typhoon whipping across the surface miles above. "I was surprised by just how cleanly we can record whales, ships, and all sorts of activity taking place at the surface," Dziak noted. Dziak hopes to return to Challenger Deep to capture more audio in the future. He'd also like to use his high-pressure hydrophone to explore other uncharted waters, including remote areas of the deep Arctic Ocean that are now starting to open up to ships as the ice caps retreat. "It is akin to sending a deep-space probe to the outer solar system," Dziak said. "We're sending out a deep-ocean probe to the unknown reaches of inner space."